Catie is great at teaching, riding her adaptive trike, being funny, keeping the peace between her siblings, and just being nice. That is how her younger sister proudly describes her. Catie participates in gymnastics and challenger soccer. Catie loves to read and write. She wants to be a teacher when she grows up. Catie also has ataxic cerebral palsy. It makes it feel like she is wearing socks on her hands while trying to button buttons, tie shoe laces, write with a pencil, and other fine motor skills. 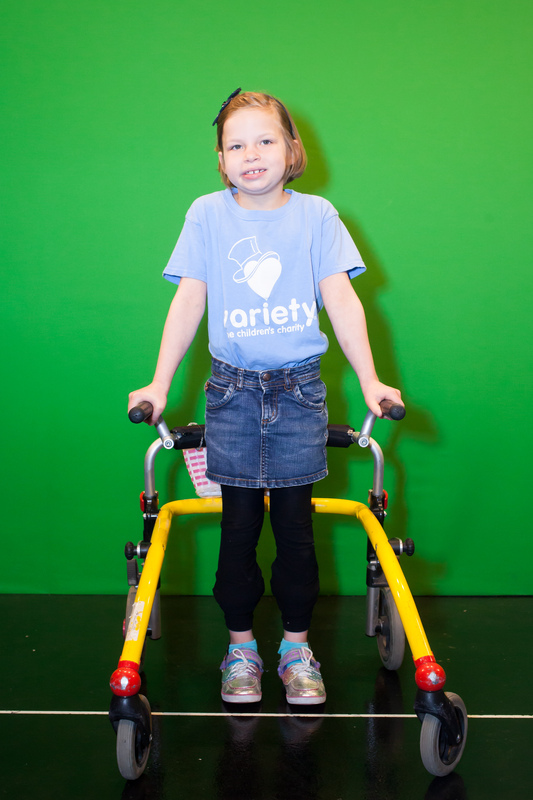 Ataxic cerebral palsy is an interruption of muscle control resulting in balance and coordination difficulty. Sometimes she stumbles, so to prevent that she uses braces on her lower legs and a walker. Catie attends therapy to make the muscles stronger and improve her motor skills. Think of the brain as a series of pipes. The brain damage or cerebral palsy is like a clog in the pipes. The brain then will create new pipes or pathways in the brain to accomplish what it needs. It’s why Catie was able to learn to walk. Her brain created a different path around the damage for her to learn to walk. Catie was born with cerebral palsy. It makes her sad when she focuses on the ways she is different from other kids. The beginning of each school year brings some anxiety for Catie. How will the kids react to seeing her with her walker and braces? Catie and her mom talk to the class about ataxic cerebral palsy, what it means in her life, and invite her class to ask questions. Kids at Catie’s school are eager to help her when they can. That is not a big surprise as she has always made friends easily. Catie’s mom is proud of how she perseveres, which means she keeps trying when things are difficult. She believes Catie’s mind is like a treasure chest. She has a wealth of knowledge and understanding locked away in the box. Doctors, therapy, medicine and hard work are the keys to unlock the box. Some days it feels as though they found the right key to open the box and other days it feels as though they have no keys and the box is locked tight. Maddox enjoys learning about history and transportation. He plays soccer and football. He loves his service dog, July. He has a great sense of humor. Maddox was born with cerebral palsy, an autism spectrum disorder and Duchenne’s Muscular Dystrophy. Maddox has high muscle tone (too much tension in his muscles), particularly in his right side caused by his cerebral palsy. That is why he walks with a walker and uses a wheelchair for distance. His Duchenne’s Muscular Dystrophy is a “low tone” disease. The MD will cause muscle degeneration over time and he will become wheelchair bound. Maddox is also on the Autism spectrum, which for him means eye contact is difficult and he needs structure. He can also get stuck on topics and sometimes repeats things. July can pull Maddox in his manual wheelchair. She can also open doors, drawers and do light switches. Maddox can brace on her and pull himself to standing. July also has a calming effect on Maddox. July allows Maddox to be the kid with the dog, rather than the kid in the wheelchair. Maddox has lots of friends at school who love to assist him when he needs help. Maddox plays soccer with Sporting Blue Valley in their TeamSoccer program. He plays Challenger Football and rides horses at Heartland. 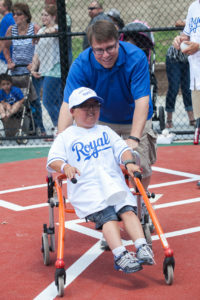 In the past he has been the 2012 Goodwill Ambassador for the State of Kansas for the MDA, the Fire Fighter Ambassador and this year he was an area Shambassador for shamrock sales. Maddox loves transportation, geography, museums and national landmarks. He is a huge fan of Abraham Lincoln and has been to ten Lincoln National Landmarks. If Maddox has an interest, his family helps him figure out how to make it work. When Maddox wanted to play soccer and football, his mom found teams that play on fields which accommodate his walker. When the family wanted to travel to Vietnam, they didn’t let it stop them that Vietnam is not very handicap accessible. If it is something worth doing, they just do it. They refuse to let disabilities stand in the way of having a great life.